Bullard laryngoscopy uses a rigid fiberoptic laryngoscope that was designed for use with patients who are difficult to intubate. In certain patients, it is not possible to visualize and access a target area, such as the glottis, without considerable effort and distortion of the internal anatomy of the patient. The Bullard laryngoscope (see the image below) resolves this problem with its simple and effective design. Bullard laryngoscopy allows visualization of the larynx without requiring alignment of the pharyngeal, laryngeal, and oral axes. The Bullard laryngoscope was invented by James Roger Bullard of Augusta, GA, in 1993 and was patented for use in 1995. It was a breakthrough in the area of fiberoptic medical devices for visualization and minimally invasive procedures. The Bullard laryngoscope refined manipulation and visualization in the field of laryngoscopy. Laryngoscopy is a procedure whereby the airway and the passage into the airway (the glottis) is visualized or exposed to provide a route for the administration of anesthetic gases, introduce an endotracheal tube for securing the airway, allow a detailed examination of the larynx and its structures, or perform minor endolaryngeal procedures (eg, obtaining tissue specimens for biopsy). In the resting human larynx, the epiglottis usually protects, and thus covers, the opening of the glottis. Therefore, it needs to be retracted out of the way when doing any of the other procedures. This retraction of the epiglottis is facilitated by laryngoscopy with the help of the blade of the laryngoscope. The first generation of laryngoscopes have a straight (Miller) or a curved (Mackintosh) blade, which is adequate for performing routine laryngoscopy in a patient. However, certain characteristics of a patient or a clinical situation may render laryngoscopy cumbersome or even hazardous. These scenarios may give rise to what is known as difficult intubation. In these cases, standard endotracheal intubation using a Miller or a Mackintosh blade may prove challenging and even result in failure. Alternative methods are then used, which may include the use of a Bullard laryngoscope to bypass or overcome these difficulties. The larynx is composed of 3 large, unpaired cartilages (cricoid, thyroid, epiglottis); 3 pairs of smaller cartilages (arytenoids, corniculate, cuneiform); and a number of intrinsic muscles (see the image below). 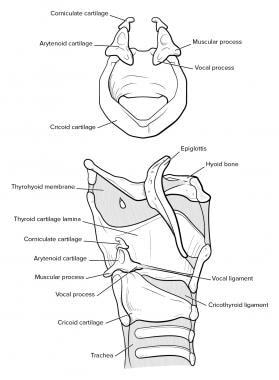 For more information about the relevant anatomy, see Larynx Anatomy and Throat Anatomy. Bullard laryngoscopy has distinct advantages in patients who are difficult to intubate, have limited or undesirable head and neck movements, have limited mouth openings, have facial fractures, or are morbidly obese. Bullard laryngoscopy causes less cervical spine movement than conventional laryngoscopy. Moreover, in patients with cervical spine disease, the Bullard laryngoscope provides quicker intubation compared with flexible fiberoptic intubation. With Bullard laryngoscopy, there is a low risk of failed intubation, less trauma to the lips and teeth, and less discomfort in the awake patient than other methods. The Bullard laryngoscope is sturdy and less likely to be damaged. It causes less cardiovascular instability than the Macintosh blade with conventional intubation technique. There is a considerable learning curve for the use of Bullard laryngoscope. Inexperienced persons are not encouraged to use this laryngoscope in difficult situations. In addition, the Bullard laryngoscope is expensive and is cumbersome to clean and maintain. Constant positioning and repositioning while changing the tip extender blade may increase the costs and risks of the surgical procedure being undertaken. If a tracheal tube larger than 7.5 mm is used, the introducing stylet may be pushed posteriorly and thus obscure the view. Sometimes, the orotracheal tube may hit against the right arytenoid cartilage and a large epiglottis, leading to problems. If laser is to be used, the metallic laser tube cannot be fitted over the introducing stylet. In these cases, a standard tube has to positioned first and then the metal laser tube should be introduced using a tube exchanger. Before use, the tip of the laryngoscope blade housing the image bundle at the end of the sheath should be cleaned thoroughly. The Bullard laryngoscope is specifically designed for difficult intubation and has a rigid, anatomically curved blade. On the posterior aspect of the blade, a sheath is provided for introduction of fiberoptic bundles for illumination and visualization. It is therefore a rigid and fiberoptic laryngoscope together in the same apparatus. A viewing arm with an eyepiece is located at an angle of 45 degrees from the handle. The newer designs of the Bullard laryngoscope include an eyepiece that can be focused. Also, for operators with refractive errors, a diopter can be snapped onto the instrument when required. The Bullard laryngoscope comes in three sizes: pediatric, pediatric long, and adult. The pediatric version is used for infants and babies. The pediatric long version can be used in small children, up to 8-10 years of age. The adult version is useful for adults and bigger children older than 8-10 years of age. The blade on the adult version has a deeper curve than on the pediatric versions. Also, a tip extender made of plastic is available to lengthen the tip of the adult blade. This is useful for intubating male patients but is usually not required for female patients. The handle may contain batteries and a halogen bulb and/or have an adaptor for a flexible cable that is connected to a high-intensity light source that may be halogen or xenon. Light from the source is transmitted to the distal blade through the fiberoptic bundle. A working channel for suction and/or insufflations extends from the body of the scope to the end of the tip where the light bundles end. The end nearest the handle has two openings. The first opening is for the Luer-lock connector, which can be attached to a medication syringe. It can be used for suction, insufflation of oxygen, or for local anesthetic or saline during the procedure. The second opening has an attachment for the introducing stylet, which may be an introducing/intubating stylet or multifunctional stylet. The introducing or intubating stylet is thin, with a curve to the left at approximately 20 degrees near the tip. This brings the end of the stylet into the field of vision and facilitates passage of the tracheal tube into the laryngeal inlet. It attaches near the base of the viewing arm with a spring-loaded, locking mechanism. Studies have shown that the use of this stylet results in fewer attempts at intubation and faster intubations than other methods. The multifunctional stylet consists of a long, hollow tube affixed to and extending generally parallel to the laryngoscope body. It is curved at the tip to direct the tube into the field of vision. It may attach to the viewing arm using a screw clamp. Its hollow core can serve as a guide by threading a flexible fiberscope, tracheal tube exchanger, or a small catheter through it. It is more difficult to maneuver than the introducing stylet. The multifunctional intubating stylet was patented in 1997. 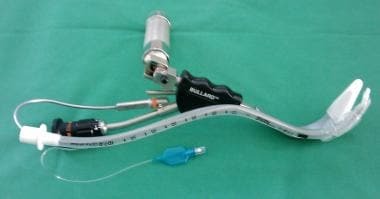 Bullard laryngoscopy may be performed in the awake patient under topical or local anesthesia, or in the anaesthetized patient who is paralyzed or breathing spontaneously. When using topical anesthesia, if the patient is not adequately desensitized, a local anesthetic may be sprayed through the working channel to optimize the anesthesia. The user is positioned at the patient’s head, with the laryngoscope held in the left hand, keeping the handle horizontal. The patient's head is kept in the neutral position. Insert the blade of the Bullard laryngoscope into the oral cavity. Rotate it from horizontal to vertical, which will allow the blade to move around the tongue. With the laryngoscope fully vertical, allow the blade to drop momentarily to the patient’s posterior pharynx. Next, elevate the blade against the tongue’s dorsal surface. Upward movement along the axis of the handle should be minimal and results in the blade of the laryngoscope lifting the epiglottis. The glottis opening is now fully visible. In some patients it may be necessary to remove the laryngoscope, mount a blade tip extender, and then reinsert the laryngoscope to achieve an effective blade length because the location of the glottis and epiglottis differs from patient to patient. Jet ventilation may be used or oxygen may be delivered from the working channel on the side. If needed, apply suction through the working channel to clear secretions. Oxygen administration also helps to clear secretions and prevent fogging. If using a pediatric or multifunctional stylet, disengage the tracheal tube connector and backload it over the stylet. Position pediatric and multipurpose stylets near the tip of the tracheal tube but not protruding through the end. Apply a small amount of lubricant to the stylet and tube before placing the tracheal tube over the stylet. Thread the adult tracheal tube over the lubricated stylet so that the stylet tip protrudes through the Murphy eye. Alternatively, an endotracheal tube can be mounted on the exterior of the stylet. Pass a guide member through the interior of the stylet and advance it through the patient's vocal cords into the trachea. Then advance the endotracheal tube along the guide member until it is in a desired location in the patient's trachea to permit ventilation. Fasten the stylet-tracheal tube combination to the laryngoscope, which brings the vertical part of the stylet behind and to the right side of the laryngoscope in the groove formed by the blade anteriorly and by the lens housing in the middle. When properly loaded, the tip of the introducing stylet should be visible at the four-o'clock position through the eyepiece or video camera. The tip of the multipurpose stylet is usually not visible. For oral intubation, insert the blade midline into the oral cavity, with the handle horizontal, either by manually opening the mouth or with the aid of a tongue blade. The handle sometimes impinges upon the chest during insertion, especially in obese patients. In these cases, remove it prior to insertion and reconnect after the laryngoscope is positioned in the pharynx. As the blade is advanced, rotate the handle to the vertical position so that the blade slides over the tongue. Once the blade has been rotated around the tongue, exert upward movement along the axis of the handle to visualize the larynx. If properly placed, either the epiglottis or glottis should come into view through the eyepiece. Occasionally, slight displacement of the blade posteriorly followed by use of the blade (directly or indirectly) to lift the epiglottis vertically may be necessary to optimize visualization. If the tube passes through the vocal cords but cannot be advanced past the level of the cricoid cartilage, angle the laryngoscope slightly forward. The Bullard laryngoscope can also be used for oral intubation without the stylet by passing the catheter through the channel where the introducing stylet normally attaches. For nasotracheal intubation, no stylet is used. A directional tip tracheal tube may be especially useful. Use the Bullard laryngoscope to visualize the larynx. Manipulate the patient’s head position and thyroid cartilage to allow advancement of the tube between the vocal cords. Another method of nasal intubation involves oral intubation first. Place a small tube changing catheter through the nose. Under direct vision, manipulate it alongside the oral tracheal tube. Then remove the oral tube and pass the nasal tube over the catheter into the larynx. When using the multifunctional stylet, visualize the larynx first and advance the tube until it is visible. If possible, advance the tube between the vocal cords. If this is not possible, a catheter can sometimes be threaded through the stylet into the larynx followed by advancement of the tracheal tube over the catheter. The tracheal tube is then threaded over the catheter into the larynx. Ghouri AF, Bernstein CA. Use of the Bullard laryngoscope blade in patients with maxillofacial injuries. Anesthesiology. 1996 Feb. 84(2):490. [Medline]. Spain K. Use of the Bullard laryngoscope in the adult patient with epiglottitis: a case report. AANA J. 2002 Apr. 70(2):127-9. [Medline]. Zamora JE, Nolan RL, Sharan S, Day AG. Evaluation of the Bullard, GlideScope, Viewmax, and Macintosh laryngoscopes using a cadaver model to simulate the difficult airway. J Clin Anesth. 2011 Feb. 23(1):27-34. [Medline]. Weiss M, Schwarz U, Gerber AC. Difficult airway management: comparison of the Bullard laryngoscope with the video-optical intubation stylet. Can J Anaesth. 2000 Mar. 47 (3):280-4. [Medline]. Tampo A, Suzuki A, Matsumoto M, Kunisawa T, Iwasaki H. Nasotracheal intubation by combined use of a Bullard™ laryngoscope and a cuff inflation technique in a patient with a severely restricted mouth opening. Can J Anaesth. 2013 Jan. 60 (1):85-6. [Medline]. Pott LM, Santrock D. Teaching without a teacher: developing competence with a Bullard laryngoscope using only a structured self-learning course and practicing on a mannequin. J Clin Anesth. 2007 Dec. 19 (8):583-6. [Medline].